CommEx tickets include admission to the Aurora Awards ceremony on Aug. 3, 2016. We ask that you please RSVP for the Aurora Awards, in addition to CommEx. If you can only attend the Aurora Awards, and not CommEx, please CLICK HERE to RSVP. There is a room block for PRSA at the Anchorage Marriott Downtown from July 30, 2016 – August 8, 2016. The special rate is $289 per night. Sponsor Alaska’s largest public relations conference and reach every public relations professional in Alaska! Learn more by CLICKING HERE to view the sponsorship form. 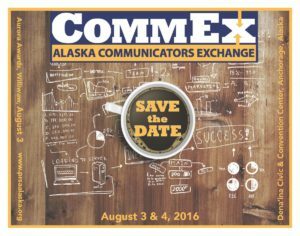 CommEx, our annual conference will be held August 3-4, 2016 in Anchorage, Alaska at the Dena’ina Civic and Convention Center. The Aurora Awards Banquet will be held August 3 at Williwaw in Anchorage. Join professionals from all industries at CommEx, a two-day, state-wide, conference in downtown Anchorage featuring national and local speakers. Sessions are designed by top Alaska communications professionals for those interested in the emerging and current trends, shifting how organizations communicate. Topics include: metrics, reputation management, strategic thinking, crisis communication, media relations, branded content, word-of-mouth, social networks and government relations.